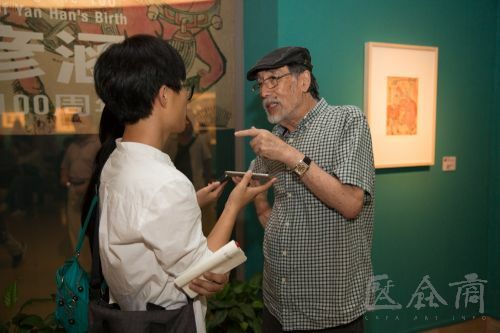 The senior professor of the CAFA Department of Printmaking, Guang Jun was a student of Yan Han and he was present at the exhibition “Commemorating the 100th Anniversary of Yan Han’s Birth”, and talked about the relationship between Yan Han’s art and life, forms of creation and proposed the problems of the current art teaching of the academic schools, as well as how we should study and inherit the artistic spirit of the previous generation of artists. 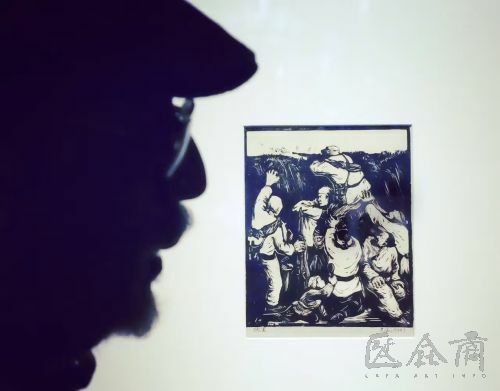 The memorial show of Yan Han features many woodcuts of the Yan’an period, and perhaps many young spectators find these works rustic, far away from the contemporary. 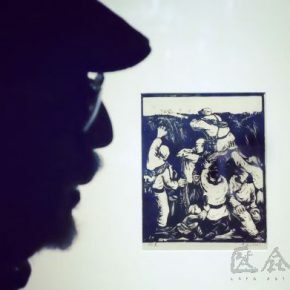 I remember an interesting story, when Yan Han visited Huang Yongyu’s home in 1973, I was there too, Yan Han told Huang Yongyu that he saw a Hungarian painter’s chromatic woodcuts catalogue and felt it very good, so he wanted to learn this form. 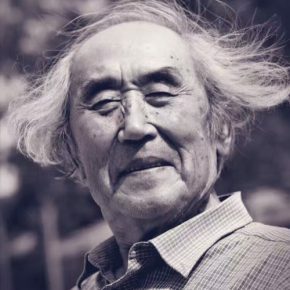 Yan Han might want to have a change, but Huang Yongyu told him that, “Do not learn from the foreign flavor, you should adhere to Yan Han’s rustic influence.” Its meaning is that although your art of the Yan’an period looks rustic, it is your characteristics and the posterity that can never beachieved. 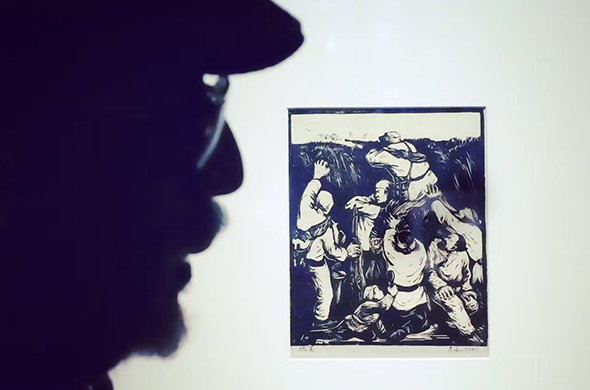 Although it seems that many paintings perform “revolutionary life”, his generation of artists didn’t aim at doing this for the occasion and publicity and they really had been thinking they were doing art, making the art of the revolution. 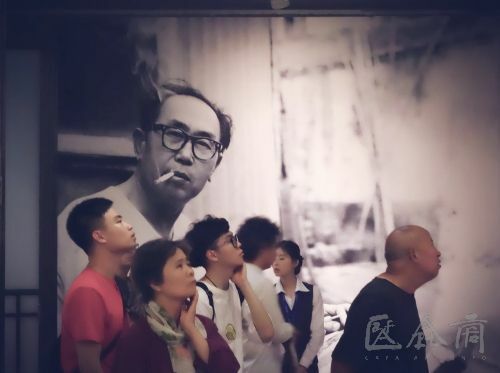 In the mind of young people at that time, “revolution” was the same as the contemporary concept now and he took it as art, so that we can find some special lyrical meanings when seeing the works of the older generation of artists like Yan Han. 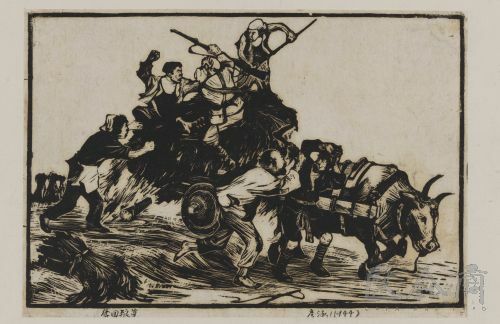 When he taught us to draw a scene of driving a carriage, I felt the gesture of whipping was uncomfortable at first glance, but the person who has life experiences knows that it offers strength. 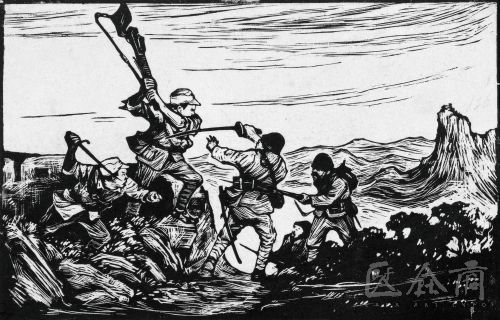 When we see “When the Enemies Search the Mountain”, we can find that it is of an exquisite form. 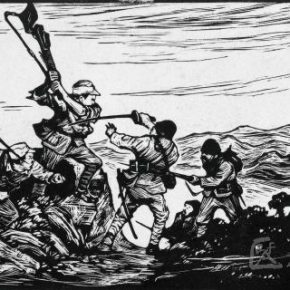 The soldier’s gun and baggage form a line behind them and the arm of the soldier climbing up also presents a line and all the forces of these two lines are concentrated in the muzzle, if he didn’t consider the form, how would he have such a composition? 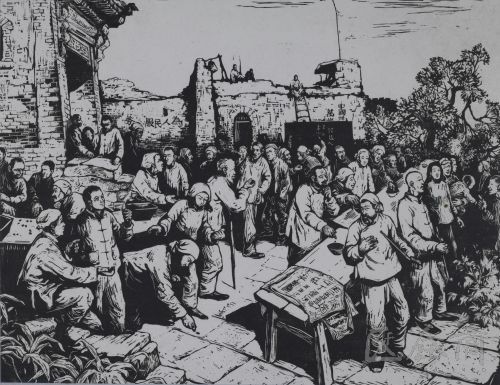 It is the exquisite place of Yan’s formal language, so that we can’t consider rough prints after the new woodcut movement started, it must be very exquisite. 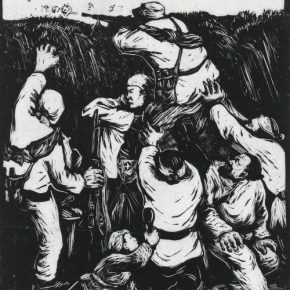 This group of people would become original masters of oil painting, sculpture, craftsman, but because of the war, they finally chose printmaking. 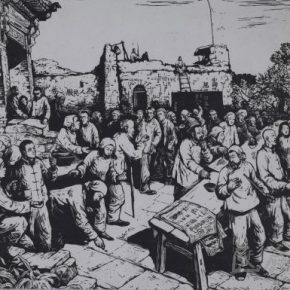 Li Qun said they once drew sill life such as bananas, apples and pears, but they were in the face of a battle, so he could do nothing but make the print instead of them, they chose it only because printmaking could involve a fight at any time, but it was not their pursuit. 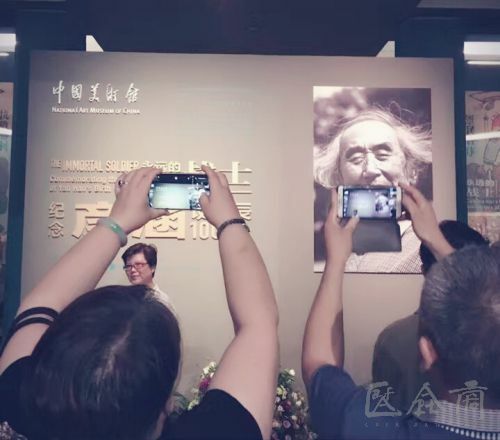 Of course, they returned to their own profession after the liberation,while some people continued the creation of print, such as Li Hua and Yan Han. 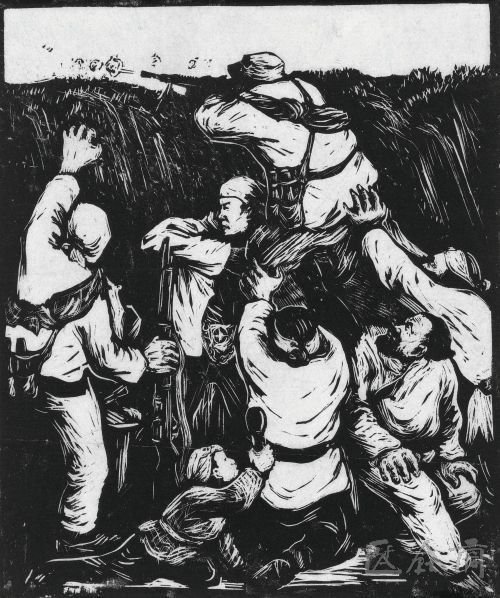 When we emphasize the creation of a given theme, Yan Han said, “When I was in a hail of bullets, the only beautiful thing was to fight, longing for peace, I opposed the war, which was the given theme.” Now our earth is badly destroyed, what can we give to future generations, art is to express such thoughts, which is today’s given theme. Our curriculum setting should focus on the features of print, why print must pursue realism like oil painting? If it pursues the photographic realism, it is not the print,it is the opposite system. 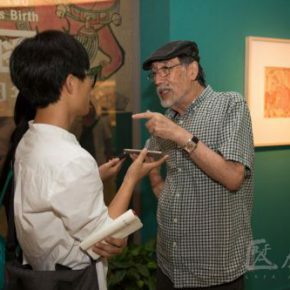 When I was the Director of the Department of Printmaking, I reduced the course of drawing to two and a half years, while it was a four-year course in the past. Later, I advocated free walking in between a variety of printmaking categories, in order to reinforce the synthesis. 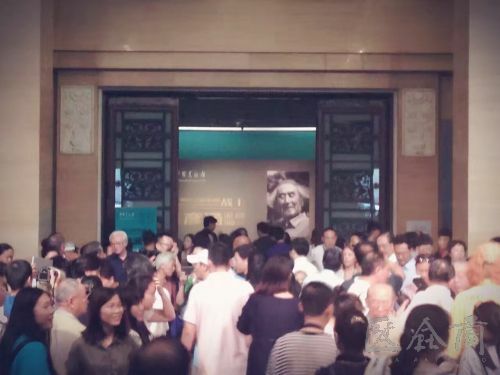 I even thought of cancelling the Department of Printmaking, and CAFA would become a big academy of fine arts. For the education of our academy, the most tragic thing is to develop groups of craftsmen without any thought, while thought is the first thing we should emphasize in the creation of prints. 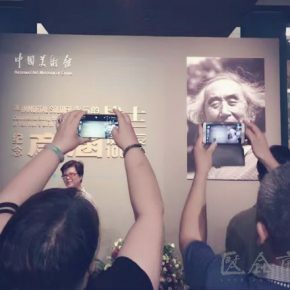 Many people said our graduation exhibition was “refined” and “technical”, and even the frames were amazing, but they lacked thought, very ordinary, mediocre, boring, and rather anemic. 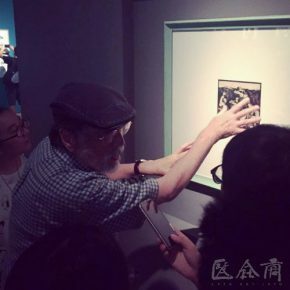 We find that all works copy photos, and even Chinese painting copies photos, including printmaking, it is an overall degradation. 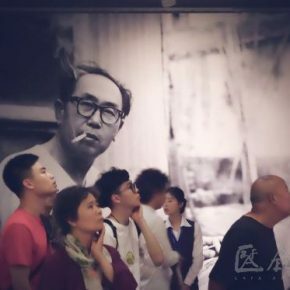 People perennially ponder and practice realism, I believe that it has nothing to do with art, it is science and art should give more consideration to the expression of ideas.